Moose Malloy hires Philip Marlowe to find Malloy's girfriend. The trail leads to a complex world of deceit and violence. Claire Trevor is a great favorite of mine for this as well as Born to Kill ('47), Raw Deal ('48), and Key Largo ('48). 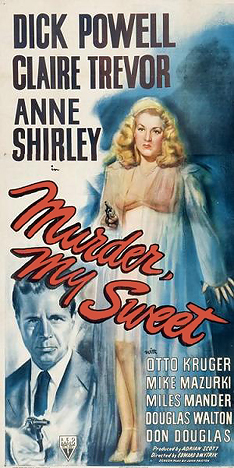 Murder, My Sweet is a major entry in the noir canon, made in the pivotal year of '44.